Kapiti Coast District is a local government district in the lower North Island of New Zealand, 50 km north of Wellington. 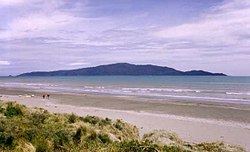 The district is named after Kapiti Island, a prominent landmark 5 km offshore. The population of the district is concentrated in the chain of coastal settlements along State Highway One: Otaki, Te Horo, Waikanae, Paraparaumu, Raumati and Paekakariki. Paraparaumu is the most populous of these towns and the commercial and administrative centre. Much of the rural land is given over to horticulture; market gardens are common along the highway between the settlements. Paraparumu has a small airport with daily scheduled flights to across the Cook Strait to Nelson and Blenheim. The area available for agriculture and settlement is narrow and coastal. Much of the eastern part of the district is within the Tararua Forest Park, which covers the rugged Tararua Range, with peaks rising to over 1500 m.
The district is administered by the Kāpiti Coast District Council, a local body elected by residents every three years. (Although "Kapiti Coast" is the official name of the district, the council uses the Maori-language spelling "Kāpiti" on its website, despite this spelling being unrelated to the original Maori name for the island.) The council consists of a mayor and 10 councillors. Residents also elect a community board for their local area. The Wellington Regional Council (branded as Greater Wellington) is responsible for regional governance of the district including public transport, water and environmental management. Apart from Kapiti Island, perhaps the most visible features of the Kapiti Coast are Kapiti Coast Airport and Queen Elizabeth Park. The airport is sandwiched between Paraparaumu (to the north) and Raumati (to the south). Possessing three runways (one of which is now closed), it once served as the main airport of the Wellington region, but was until recently used mainly by aeroclubs. In 2011 scheduled commercial flights from Kapiti to Auckland were resumed. The park, lying to the south of Raumati, is a popular attraction which covers some 12 km². The park extends to Paekakariki, and includes the Wellington Tramway Museum. Other tourist attractions on the Kapiti Coast include the Paraparaumu Golf Course. Another attraction a few kilometres north of the town centre is the Southward Car Museum in Otaihanga. The district is on the North Island Main Trunk railway line (NIMT), and is served as far north as Waikanae by suburban passenger trains operating on what is referred to as the Kapiti Line. The district's population at the June 2018 census was 53,200. Although administratively part of the Wellington Region, the Kapiti Coast is geographically and socially distinct from Wellington, Porirua and the Hutt Valley, which together make up the nucleus of the region. However many residents travel into Wellington each day for work and the whole Kapiti Coast is a popular weekend destination for the people of the Wellington Region. Many migrate to the area for their retirement. The town of Paraparaumu, considered the pivot of the district, is located about 55 km north of Wellington. Many Kapiti Coast District residents work in Wellington. Commuters to the four cities located in the Greater Wellington Region make up 36% of the workforce of the Kapiti Urban Area (Paraparaumu, Waikanae, Paekakariki) and 12% of the workforce of Otaki. One of Wellington's two main commuter rail links, the Kapiti Line, terminates in Waikanae. There are also commuter bus services. State Highway One connects the Kapiti Coast to Wellington. The road is a narrow, coastal highway that is highly congested and has been subject to occasional closure due to land slides. The Transmission Gully Motorway has long been mooted both as a commuter route and an alternative access to the capital in case of a civil defence emergency. Construction of the route officially began on 8 September 2014 and completion is scheduled for 2020. The population of the district has grown rapidly since the 1980s, fueled in large part by Wellingtonians moving to the coast to retire. More Kapiti Coasters are over the retirement age than in any other district or city in the country - 23.3% of the district's population is over 65; compared with 9.4% in the four cities of the Wellington Region, and 12.1% of New Zealand as a whole. Most of the district was originally part of the now-defunct Hutt County. The Kapiti Borough Council was carved from it in 1973; in the local government reorganization of 1989, the Borough Council was replaced by the Kāpiti Coast District Council, and the area under its jurisdiction expanded northwards to include Waikanae and Otaki, which had been part of the former Horowhenua County. ^ "Kāpiti Coast District Council". kapiticoast.govt.nz. 2016-04-08. Retrieved 2016-04-08. ^ "New Zealand Gazetteer: Search for Place Names". Land Information New Zealand. 2016-04-08. Retrieved 2016-04-08. ^ "Land Information New Zealand: Kapiti Island". Retrieved 31 May 2018. ^ a b "Commuting Patterns in New Zealand: 1996–2006 - Statistics New Zealand". Stats.govt.nz. 2009-07-22. Retrieved 2012-12-27. This page was last edited on 1 November 2018, at 09:01 (UTC).